The Capricorn Mythology and lore. Capricorn Mythology, What is it about? Capricorn Mythology in ancient Sumeria was associated with the planet Saturn and the Mesopotamian god Enki. The goat-fish is a representation of Enki, seen on Babylonian monuments. Enki was a god in Mesopotamian legend; later Enki became Ea in Babylonian legend. In the beginning, Enki was the main supreme being of the metropolis of Eridu. Enki was the god of artisanship (gašam); water, saltwater, lake water (a, aba, ab), intellect (gestú, meaning "ear") and creative activity (Nudimmud). In ancient Babylonian legend Capricorn was described as the "deity Ea", who was fishtailed. Ea was the “Antelope of the Sea”. Capricornus is recognized by the name the “Gate of Death” (polar to the Cancer sign, “Gate of Birth“. Capricorn relates to the time the Sun embarks the tenth part of its orbit and relates to the time of new knowledge. Ea is perceived as coming up from the oceanic abyss to teach humanity the wisdom of the gods. The Capricorn zodiac sign is called "šaxû ibex" in Babylonian. The sun in that month moved into the "suxûru" or fish constellation, which is called the star of Tashmetum. Tashmetum is a goddess of Akkadian mythology. Tashmetum is the wife of the deity Nabu....Nabu is the god of wisdom and writing in Babylonian Legend. Babylonians revere Nabu because he is the son of Marduk (or Merodach) and his wife, Sarpanitum. In addition, Nabu is worshiped since Enki/Ea is his grandfather. However, the whole depiction of Capricornus as we know it now derives from the Greeks. Capricorn Mythology begins with Cronus who was a giant, and the Father-God of the deities. Even as Cronus brought down his own father named Uranos, Cronus realized one of his own children would subvert him. Thus, when each of his and wife Rhea's babies were born, he ate them whole. Hestia, Demeter, Hades, Poseidon, Hera, altogether, swallowed before they could mature and jeopardize his dominion. Rhea wanted a child, so when Zeus was born into the world, Rhea hid baby Zeus in a cave and placed him with surrogate parents. Then, Rhea draped a stone in swaddling clothes and fed that to Cronus. Thus sparing Zeus the same fate as his sisters and brothers. There are other variations of this legend. In another variant, a goat-tending nymph called Amalthea or Adamanthea brought up Zeus. Yet in another version of this myth, the actual goat itself named Amalthea brought up Zeus. However, the one thing that never changes in all the stories is that Zeus suckled on goat’s milk, or ambrosia in some versions. The Titans and Cyclopes gave Zeus great power over thunder and lightning. With the Titans and the Cyclopes assisting, Zeus brought down Cronus, and pressured him to cough up Zeus' brothers and sisters, Hestia, Demeter, Hades, Poseidon and Hera. To continue the story, Zeus then placed Amalthea or Adamanthea in the heavens (this is called Catasterismi in Greek which means: placing amid the stars) in thanks, as the constellation Capricornus, the Goat. The horns from Amalthea the goat later became the Horn of Plenty, or Cornucopia. Ancient sources say that Cornucopia comes from the sun "taking nourishment" in provision for its ascent north. Additionally, Capricorn Mythology is linked with the Saturn and the God Aristaeus. In some adaptations of the Capricorn Mythology, the goat's skin is the Golden Fleece that Jason and the Argonauts sought out and stole. Yet in another custom, Capricorn stands for the deity Pan-the goat god who metamorphosed into a sea animal. One legend says, when Pan was being assaulted by Typhon, Pan plunged himself into the Nile River; the parts above the river water stayed goat, however the parts below the water changed into a fish. 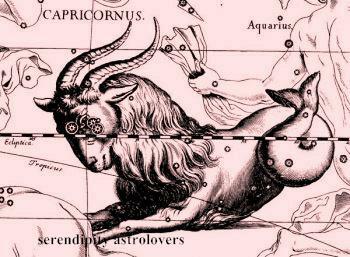 Even now, the Capricorn constellation is portrayed as a sea-goat, (a goat with a fish’s tail). *Capricornus is one of the eighty-eight new constellations, and one of the forty-eight constellations named by Ptolemy. *From Mesopotamia we get the early representations, and some of the current ones, drawn as a half-goat, half-fish. Capricorn from the Latin (Capricornus, literally meaning, Goat-Horned), directly translated to Greek (Aigokeros)-- Goat-Horned, from the words aigos or aix a goat and keros a horn,translated to Akkad (Suhu-massa), translated to Sumerian (Suhur.mas), both Akkad and Sumerian meaning the Fish-Goat.